MADISON, Wis. — Size doesn’t matter. An unknown band plays a concert to a half-filled venue isn’t much of a story. Unless, that is, it’s about Vetiver and how this California-based folk-rock troupe is continuing its laidback effort to win converts to its enchanting, low-key melodies with performances like they the one they pulled off Tuesday night at Madison’s High Noon Saloon. Movements always start small and it certainly seemed the groundwork was laid at this show full of acoustic-guitar odes, funky country and ballsy roots rockers. The couple hundred people who came to see the flannel-clad band found ample reason why Vetiver remains one of underground rock’s best kept secrets and why this secret might not last too much longer. If you look for clues of why Vetiver operates under the radar even among the indie-rock set, there are plenty to concoct a theory around. The haters might say the group is too much of a ’70s soft-rock throwback; they don’t jam; their records aren’t consistent enough; the songs lack big-ticket hooks; they don’t tour enough. Worst of all, they charge the band’s workman-like qualities and ensemble playing radiate little star appeal. These all might contain a kernel of truth, but shouldn’t be used to discount what the band has achieved, how they are now and what they seem poised to do. Vetiver’s rise has been slow and steady. While leader/songwriter Andy Cabic has been steering various lineups of the San Francisco group since the mid-’00s, friends and other stylistic compatriots have sprinted far ahead to receive more blog buzz, bigger venues and improved record sales. Artists like Iron & Wine, Fleet Foxes or Bon Iver have scored major attention by marrying acoustic guitars, lush choruses and romantic sensibilities. Vetiver hasn’t had that kind of breakout release as yet. They’ve still operated in the shadows, partially concealed by bigger personalities who move in their musical circle. 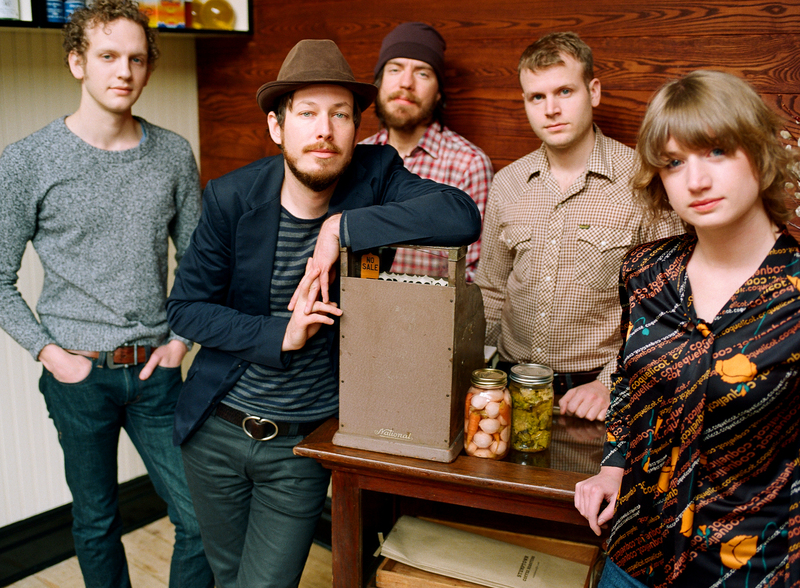 While Vetiver is firmly entrenched in the hippie-affected, folk-music revival proselytized by friends Devendra Banhart and Joanna Newsom, labeling the group as “freak folk” is a misidentification. Vetiver frequently toured with Banhart and Cabic served as Banhart’s songwriting pal and road guitarist, but Vetiver’s songs have a discipline and understated allure that Banhart’s work is only now beginning to strive towards. While Vetiver is still obscured in the wake of its onetime mentor and the reserved Cabic lacks the messianic presence of the Bearded One, his group has continued to evolve and refine its craft in its brief tours. During the band’s hour-long set on Tuesday night, the quintet proved how adaptable and combustible unit these musicians have become — whether it was on their own originals or the select covers they worked in. Centered around Cabic, the band members are prophets of a resurrected singer-songwriter movement. Many might have seen the flowering of the James Taylors and Cat Stevens in the ’70s was a brief instance when the spirit of acoustic-guitar introspection offered reprieve from the traumas and revolutionary failures of the late ’60s. Cabic and company, however, believe this music has a power and worth that extends beyond what’s popular at any moment. This is the kind of music “American Idol” crank Simon Cowell would label indulgent. Vetiver fervently honors it. They’re exponents of the American songbook, which is also the primary reason the band is alien to the jam-band scene despite how much common ground they share. Like the Band before them, Vetiver shies away from instrumental showboating to emphasize the songs. The band’s performances cast their tunes and those that they covered, like Townes Van Zandt or Bobby Charles, as having a power, intelligence and sympathy that rejects songwriting hack’s cheap tricks. If the curious went in thinking this would just be a bard’s coffeehouse performance, the strolling, clavinet-stoked funk of “Another Reason To Go” signaled there is more to Vetiver than beards and acoustic guitars. This was a rush of New Orleans music that Dr. John would be eagar to claim as his own. As Cabic warbled and strummed, the group’s new guitarist hit stinging notes to accent the song’s pimp strut. The song’s turnaround also gave excellent drummer Otto Hauser a chance for some striking drum fills. Equally funky for about a bunch of folkies was the group’s take on Van Zandt’s “Standin’,” which chugged along like a locomotive jamboree. The backing musicians’ high harmonies calling out like a lonesome train whistles above the Hauser-powered, driving rhythm. As expected, the band proved it could downshift into the quieter material. What was so remarkable was how moving a rote performance could be. The acoustic beauty of “Maureen” didn’t coax any lighters or cell phones to be held aloft, but Cabic’s sweet singing and gorgeously gentle fingerpicking prompted many of the couples in the audience to put their arms around each other. As Cabic seduced his love with his eyes closed, you could see the crowd quietly swaying. The cool-tempered Cabic was the eye of the musical storm (maybe it was more of an enjoyable, occasionally gusting breeze) onstage. Seemingly unflappable and at ease behind the microphone, the brown fedora-wearing Cabic sang and played guitar with a surgeon’s precision. The only hint of excursion was his flush cheeks peeking behind his beard whiskers. Someone in the audience noted aloud how much Cabic’s soothing voice echoes Paul Simon’s and then pointed out how his curly-haired guitar player looked like Art Garfunkel. (I would have said Bernie Leadon of the Eagles.) While Cabic didn’t hear the Simon comparison, he testified to his fandom when he vowed minutes later to sing Simon’s “You Can Call Me Al” for the karaoke competition after the group’s performance. It was the karaoke performance that would be the night’s villain. The only mistake Vetiver made on this evening was in leaving the stage to make time for the next scheduled act. While polite to the rules before him, Cabic appeared to offer a plea for more time during adrenaline-charged set closer “More Of This.” “It won’t be long before I have to leave,” Cabic calmly warned the crowd in song as he and the guitar player traded Scotty Moore-approved percussive guitar riffs. Alas, it was not to be. And although Vetiver might be indie-rock heretics in the jam-band universe, the band could care less about those kind of rules. To underscore the point, they kicked into an exuberant version of the Grateful Dead’s cover of “Don’t Ease Me In” for their one-song encore. Like the Dead before them, this traditional folk favorite in the hand of such journeymen players somehow transformed the band into a pack of shod-busting barroom angels. From there, Vetiver safely commissioned another small round of disciplines to spread their praises word of mouth. This is a slow process, whether spread as a tip shared over a beer or in this era, via a music blog. Again, Cabic’s lyrics offered sage advice to those who doubt the band’s quiet qualities. “Good things take time,” he sang during the performance of “Wishing Well,” and he and the band seem to adopt this as their guiding philosophy in terms of growing their audience. Unfortunately for them, a show as great as Tuesday night’s means it won’t be this way forever. Friday, March 12, Buffalo, N.Y. Tags: Andy Cabic, freak folk, High Noon Saloon, Madison, Vetiver, Wisconsin. Bookmark the permalink.